The battle of the non-contacting measurement methods has ‘raged’, at least for those inside the industry, for more than a decade. Only now, though, with the advent of interchangeable transducers, are users able to enjoy the best of both worlds. 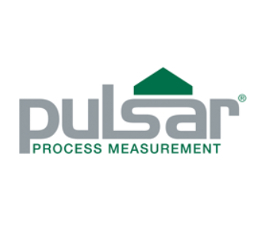 At Pulsar, we estimate that more than 95% of the measurement challenges we are presented with are readily measured using ultrasonic systems. However, there are certain measurements where RADAR units score well. Ultrasonic measurement operates by a transducer emitting and receiving an ultrasound pulse, which bounces from the target. With modern echo processing systems such as Pulsar’s DATEM there are very few applications where an ultrasonic system won’t work, unless it is a result of the atmosphere rather than, for example, a measurement in a vessel with a complicated internal structure. Non-contacting RADAR comes in two types, pulsed and FMCW, or Frequency Modulated Continuous Wave. Both emit radio frequency energy and measure a signal returning from a target with a significantly higher dielectric constant. Pulsed RADAR emits and receives discrete bursts of energy. FMCW also measures ‘time of flight’ but transmits continuously, constantly varying the frequency of the signal, comparing the frequency of the returning signal to the emitted signal using Fast Fourier Transform (FFT), to determine the distance to target. FMCW has a narrower beam angle and, typically, a stronger signal for higher accuracy. Pulsar’s smart RADAR transducers contain signal processing software. A controller remains necessary, but the family of controllers developed around ultrasonic technology operate just as well with either technique. dBR RADAR is also backwards compatible with existing Pulsar controllers, so can be retro-fitted to an existing installation where conditions have changed. Pulsar controllers operate the same, in control and communication terms, whether fitted with a dB10 or dB15 ultrasonic transducer or a dBR8 or dBR16 RADAR head. For longer range – more than a few metres – applications, RADAR has the edge. For a 6m measurement a typical ultrasonic accuracy would be ±15mm, whereas a similar RADAR measurement would offer accuracy around ±2mm. Any application where the liquid or solid surface is hot can create a temperature gradient above the surface which affects the speed of sound and reduces accuracy. RADAR is unaffected by electrical noise, for example from a nearby inverter, or excessive acoustic noise. It’s very difficult to assess this prior to installation. RADAR measurement will tend to give a more stable result on a foamy surface than ultrasonic. Because plastic has a low dielectric constant compared to a liquid surface, RADAR can ‘see’ through the container wall to the liquid surface so you can accurately measure usage and re-order points without needing a process connection to the container. The ±2mm accuracy really helps here too. With the new interchangeability, RADAR and ultrasonic can be considered as simply two solutions to the same problem. Project specification becomes easier because every application can be considered with a single set of control tools. Changes can be made at any time without the issues around a new controller which may or may not be compatible with other equipment. Service and on-site maintenance are made much simpler – only one set of control spares, only one set of instructions to learn.